The cool fall weather will soon turn colder as winter arrives forcing critters to find warm homes. A Las Vegas pest control company says the number of rat calls are already on the rise. "This is where it was sitting," said Debbie Riley, while pointing to a bottle of olive oil. "Amazingly, it didn't tip over but as you can see, the rat chewed through that without tipping it over," said Riley. Riley said she has been living in her apartment complex near Twain Avenue and Arville for the past 4 years. 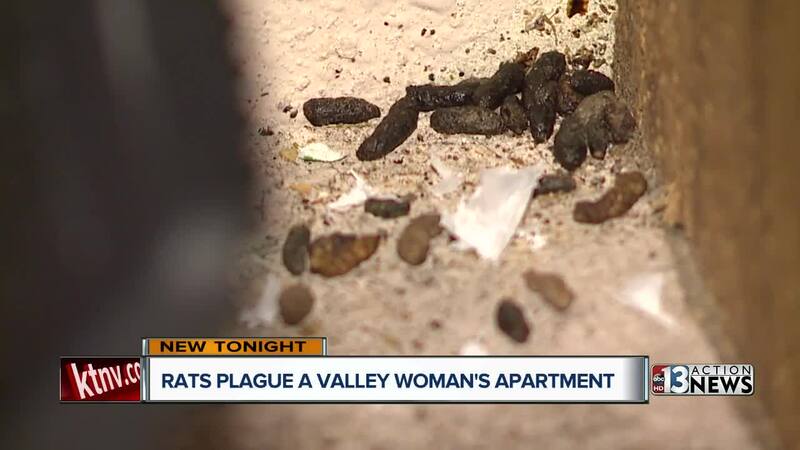 In April, she said she noticed some evidence of rats in her apartment. "I went to use the bathroom at night and he scurried and brushed across my leg," said Riley. "I still feel it and that was months ago," added Riley. Fast-forward to November, Riley said she is living in a rat nightmare. "There are a myriad of diseases that you can catch from them, most of it is from them contaminating your food and water," said Bryan Hurt with Ecogen Pest Control. Hurt said the cooler weather is a big driver for rats to flee the outdoors and make it inside nice, warm homes and apartments. The rats are excellent climbers, jumpers and swimmers, according to Hurt. Hurt said once they invade they can be tough to eradicate. "They can contaminate anything they touch, they can be greasy and leave smear marks on things," said Hurt. There are a variety of heavy duty traps, glue pads and bait stations for ridding a home of rats. Hurt said there is no section of the valley that is immune to rats and rodents. Hurt said calls for rat service easily triple compared to warm parts of the year when rats are more commonly found outside homes and properties. Back at Debbie's apartment, she has already notified her landlord in writing about the report of rats. In Nevada, landlords have up to 14 days to address problems, or make their reasonable best efforts, once notified of the problem in writing. 13 Action News reached out to Riley's apartment complex but a request for comment was not immediately returned.